A new study is now enrolling patients ages 7 to 18 years old to determine the safety and efficacy of Carbetocin for the treatment of symptoms related to PWS. A live webinar was conducted on March 19th sharing details of the study, what you can expect if you choose to participate, and eligibility criteria for participation. The presentation is 23 minutes in length, followed by 7 minutes of Q&A. You can watch the complete presentation by clicking on the embedded video. In case you don't have time to watch the full video, we've included a full transcript below. Welcome to today’s webinar! This webinar is the third in our series of clinical trial webinars and we are happy to have you joining us today. As you know, there are many clinical trials currently enrolling PWS patients for their studies. Some of these trials are investigational drugs, others are behavioral interventions. An overview of PWS clinical trials are available on fpwr.org and I encourage you to visit this site to learn more about the opportunities that are available. We are fortunate to have so many opportunities available to us. A few years ago there were few trial opportunities for people with PWS. This year alone, we will require more than 500 participants to fill these clinical trials! I know you are joining us today because you want treatments for your loved one and these trials are the first step. In order to bring any treatment to market, we need to enroll these trials so that they can collect the data necessary to show efficacy for the FDA. It will require the effort of the entire PWS community to help complete these trials and I encourage you to learn more about these opportunities, discuss them with your physicians and determine if an opportunity may be right for you and your loved on with PWS. Today’s guest presenter is from Levo Therapeutics and Davis Ryman will be sharing more information with you regarding their Phase 3 study of Carbetocin. We will be collecting questions from the audience throughout the webinar and will answer all of your questions after the short presentation. Without further delay, I give you Davis from Levo. 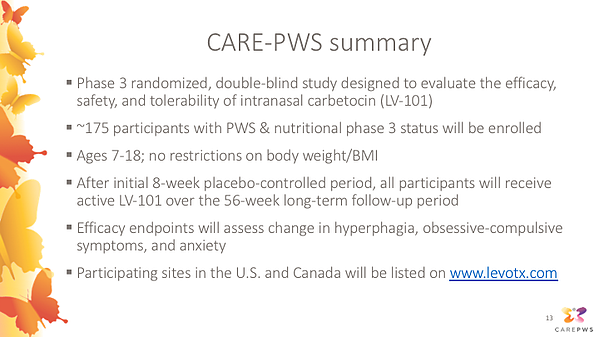 Thank you to FPWR for inviting us to give this informational webinar on our Phase 3 study, which is now evaluating an investigational medication called intranasal carbetocin (or LV-101), as a potential treatment for hyperphagia, obsessive-compulsive symptoms, and anxiety in PWS. This study is called CARE-PWS, which stands for the CARbetocin Efficacy and Safety Study in Prader-Willi Syndrome. We’ll start by giving you a brief overview of what carbetocin is, and some of the key reasons that support evaluating it as a potential treatment for PWS. We’ll then briefly review the initial data on safety and effectiveness of carbetocin, from a Phase 2 study in PWS patients that was completed in 2014 and published last year. Lastly, we’ll discuss the Phase 3 study that is currently ongoing in the US and Canada, and review planned study sites and travel arrangements for those who could be interested in enrolling. We’ll then have plenty of time for questions from the audience at the end. For purposes of full disclosure, all the presenters you’ll hear from today are employees of Levo Therapeutics, the sponsor of the CARE-PWS study. 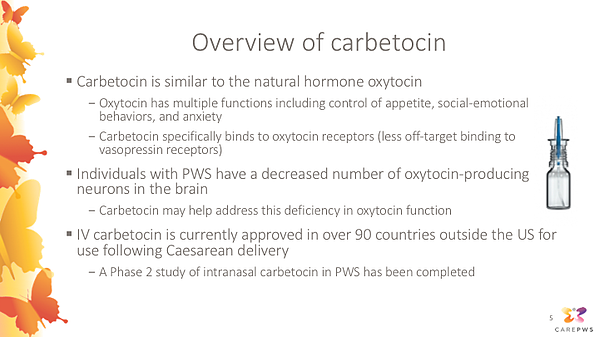 This slide covers a brief introduction to carbetocin, the experimental medication being evaluated in the CARE-PWS study; and explains some of the key reasons motivating the continued investigation of carbetocin as a potential treatment for PWS. Carbetocin is an oxytocin analog, meaning it is a synthetic molecule that has been designed to be very similar to the natural hormone oxytocin. Oxytocin is a natural hormone in humans and other mammals, which is normally produced in an area of the brain called the hypothalamus. It has multiple important functions, including the control of appetite, social and emotional behaviors, and anxiety. Carbetocin was designed to be very similar to oxytocin, but has several important differences. Compared to oxytocin itself, carbetocin binds to oxytocin receptors with much greater specificity. This means it shows less off-target binding to other receptor types, such as vasopressin receptors, than oxytocin itself does. We’re hopeful this may result in less potential for side effects than could be encountered with oxytocin itself. Carbetocin also has a longer half-life than oxytocin. This means it remains present in the body somewhat longer following each dose than oxytocin itself does. It has been shown that individuals with PWS have a significantly decreased number of oxytocin-producing neurons in the brain. Considering this fact along with the known important roles of oxytocin in control of appetite and social and emotional behaviors, we’re hopeful that use of carbetocin to try to replace this deficiency in oxytocin function may be a helpful therapeutic strategy to address the key symptoms of PWS. Intravenous (IV) carbetocin is currently approved in over 90 countries outside the US for a different use, in preventing excessive bleeding following Caesarean delivery. It’s estimated that over 10 million women have received IV carbetocin for this use, with no significant safety concerns noted to date. Because IV dosing is not well suited for chronic treatment, development of an intranasal formulation of carbetocin was initiated by Ferring Pharmaceuticals. 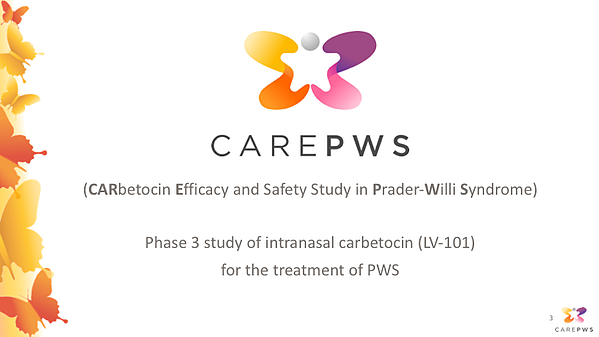 A Phase 2 study of intranasal carbetocin in PWS was completed in 2014, and we’ll present a summary of the safety and effectiveness results of this study in the coming slides. 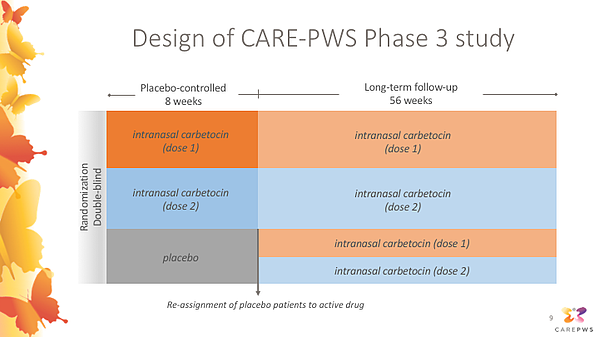 As previously mentioned, a Phase 2 study of 14 days of treatment with intranasal carbetocin or placebo in 37 participants with PWS was completed by Ferring Pharmaceuticals in 2014. This was a randomized double-blind study, meaning that participants were randomly assigned to receive either active carbetocin or an inactive placebo, and neither the participants, their caregivers, the study doctors, or the sponsoring company knew which treatment participants were assigned to. 17 participants were randomly assigned to receive intranasal carbetocin, and 20 were randomly assigned to placebo. Each of these events were rated as mild in severity by the study doctors, and none of these events led to a participant discontinuing their treatment. Overall, the results of this Phase 2 study indicated that intranasal carbetocin appeared to be safe and well tolerated, and motivated continued investigation of longer-term safety and effectiveness in the current Phase 3 study. 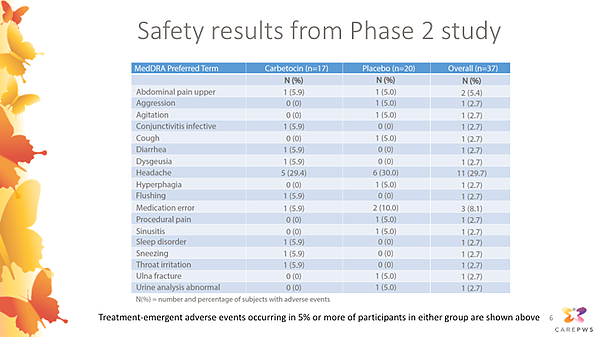 This slide presents the primary efficacy results from the Phase 2 study. To assess whether carbetocin was effective in helping to improve participants’ hyperphagia, the Phase 2 study used a questionnaire called the HPWSQ-R as the primary endpoint. This was an earlier version of the HQ-CT hyperphagia questionnaire that’s currently commonly used to assess hyperphagia in PWS clinical trials. Caregivers were asked to rate severity of hyperphagia symptoms using this questionnaire at pre-treatment baseline, study day 8, and at the end of the study at day 15. The change in hyperphagia questionnaire score for participants receiving carbetocin is shown by the orange bars, and the change in score for participants receiving placebo is shown in blue. As you can appreciate, both the carbetocin group and placebo group improved, but the carbetocin group experienced a significantly greater improvement in hyperphagia symptoms assessed using this scale. This slide shows some additional secondary endpoints that were used to test the effectiveness of carbetocin in the Phase 2 study. The CY-BOCS (or Children’s Yale-Brown Obsessive-Compulsive Scale) is a detailed assessment in which a clinician at the study site interviews the caregiver about severity of obsessive and compulsive symptoms (both food and non-food related) of the PWS participant. This showed a highly significant reduction in participants receiving carbetocin compared to placebo. 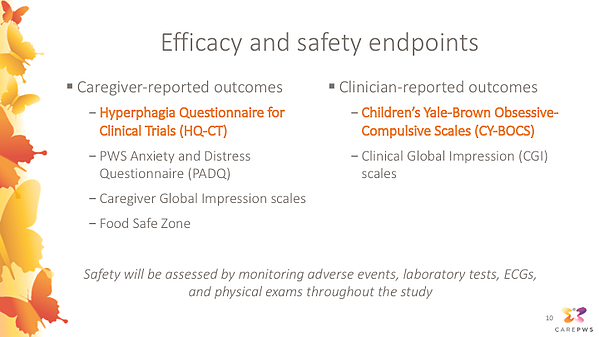 The HPWSQ-C is another version of the questionnaire measuring hyperphagia, which was completed by the clinician at each the study site, rather than by the caregivers themselves. The Reiss Profile Food Domain is another scale assessing food-related behaviors. Each of these scales also indicated a significant improvement in participants receiving carbetocin compared to placebo. Lastly, the CGI-I is a more general rating scale allowing clinicians to rate their overall impressions of the improvement in PWS symptoms as a whole. This also indicated a significant improvement in the carbetocin group compared to placebo. 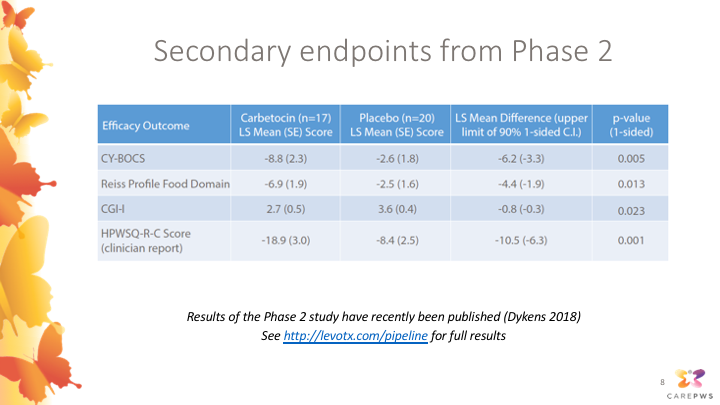 Results of this Phase 2 study have recently been published, and more detailed results are available at the website link shown below (http://levotx.com/pipeline). Overall, although more research still needs to be done, we and the Phase 2 study investigators strongly feel these results were very encouraging and supportive of continuing to move on to a larger and longer Phase 3 study, which can more fully evaluate the long-term safety and effectiveness of carbetocin as a potential treatment for PWS. This slide shows an overview of the design of the CARE-PWS Phase 3 study. This is also a randomized double-blind study, meaning that participants were randomly assigned to treatment groups, and neither the participants, their caregivers, or the study doctors will know which treatment group participants are assigned to. 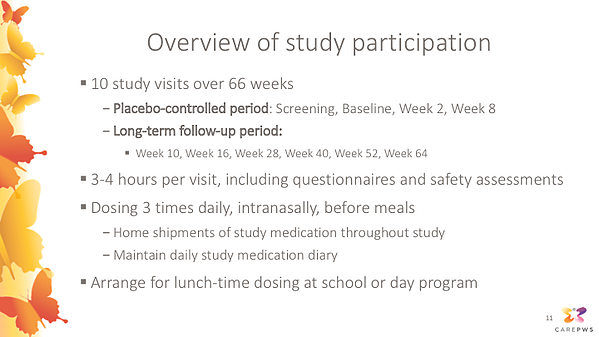 During an initial 8-week placebo-controlled period, participants may receive placebo or either one of two dosage levels of intranasal carbetocin. Following this initial 8-week placebo-controlled period, anyone previously receiving placebo will be reassigned to receive active intranasal carbetocin at either one of two dosage levels. This means that all participants will have the opportunity to receive active carbetocin throughout the 56 week long-term follow up period. In addition, safety will be assessed throughout the study by monitoring adverse events, laboratory tests, ECGs, and physical exams. Each study visit is estimated to take about 3-4 hours, including questionnaires and safety assessments. Throughout the study, study medication will be given 3 times daily as a nasal spray before meals. Home shipments of study medication will be sent throughout the study. Caregivers will be asked to maintain a daily study medication diary to document that the study medication was given as intended. For children attending school or day programs during the study, this is allowed but the ability to give lunchtime doses will be necessary; site staff and the sponsor can help with discussions with schools to facilitate this. 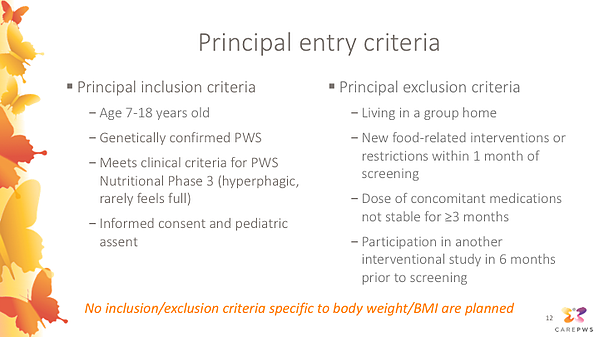 This slide summarizes the principal entry criteria for the CARE-PWS study. This is not an exhaustive list; and during screening, study doctors will more fully assess whether each participant is appropriate and safe for enrollment into the study. Of note, no inclusion/exclusion criteria specific to body weight or BMI are planned. Participants with diabetes also will not be excluded, as long as the study doctor believes they are on a stable medication regimen and are safe and appropriate for the study. Webinar attendees were invited to ask questions of the panelists. Below are the questions presented and the responses. Q. My child is in the normal range for weight and height. Can my child still participate? A. Yes. We understand that people with PWS can have significant hyperphagia and behavioral symptoms without necessarily having weight gain, especially if their caregivers have made diligent accommodations. They may still have symptoms that need treatment, because of this there are no enrollment restrictions based on weight or BMI for this study. Q. If my child is on placebo, what will be in the nasal spray? A. Both the placebo solution and the active carbetocin solution that are being used in the Phase 3 study will include the same set of inactive ingredients (not just water or saline solution). One example is that both the placebo and carbetocin are based on a very diluted solution of acetic acid (which is the same weakly acidic molecule that is in vinegar). It is so dilute that it does not cause any noticeable smell or taste. But because of that, if you feel or experiencing an apparent side effect or other sensation after taking a dose of study medication doesn’t necessarily imply whether that dose of study medication was active carbetocin or placebo. Q. If someone was to participate in the study, how long will they have access to drug? A. 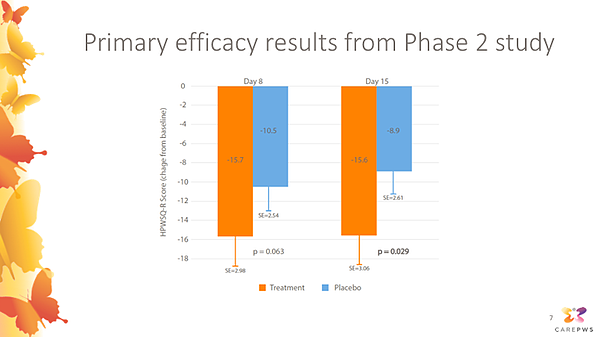 Following the initial 8 week placebo controlled period, anyone previously receiving placebo will be reassigned to receive active carbetocin during the 56 week long term follow up period and in addition to that, if the current study is successful, we are hoping to start an additional even longer term “rollover” study which will allow CARE-PWS participants to continue to receive carbetocin after the completion of the study if they want to. Q. There are two different doses available, in addition to placebo. During the longer, open access period, is there an opportunity to switch between the higher and lower dose if one is seen to be more or less effective? A. We are currently planning to evaluate two different doses in the study with the aim of seeing which of them seems to be more appropriate and safe and effective, but we do have an independent data safety monitoring board who will be independently reviewing data from the study as it becomes available and at some point during the study, if there's enough information to conclude that one of those doses is better, then they could give us advice that could enable us to rollover patients onto that recommended dose. We just don't have enough information quite yet to know and we're continuing to remain blind, since it's a blinded study. We will have the opportunity to get advice from that independent data safety monitoring board to make that decision as we get more information. Q. Is there an opportunity for individuals whose loved ones are over the age of 18 to participate? A. Not in the current study, with the exception of what I had discussed. It's actually an inclusive age range so if you're 18 and 11 months you wouldn’t be considered to be yet turned 19 and you would be eligible. The current study is enrolling people only up to that age. We're trying to maintain consistency with the study population that was examined in the phase 2 to study and so are not deviating to a great extent from that age just yet. However, if the current phase 3 study is able to confirm that carbetocin is safe and effective in our current study population we are hopeful that might potentially be applicable to older patients as well. Q. This study has been broken into two parts: a double-blind portion, followed by an open-label extension. Do you have to participate in the full 66 weeks or can you elect to participate in just a shorter double-blind portion? A. We're asking for people to continue to participate in the full length of the study. The study visits do become more spaced out and less frequent during the long-term follow-up period so we're hoping that will make continued participation less burdensome. And the reason for conducting a long-term study now is to continue to accumulate more information about the safety and effectiveness of continued long-term treatment. Considering that the phase 2 study was so successful, it was only two weeks, where we want and need to investigate and confirm whether it is a safe and effective long term treatment and we are hoping that it will be tolerated and effective over that long term course. Q. On one of your first slides you talked about some of the benefits of carbetocin, including behavior improvements and anxiety. Why does the participant need to have hyperphagia in order to participate? A. Hyperphagia is one of our primary endpoints. In order for regulators to assess approval of drugs you have to show that a drug is effective on certain primary endpoints that you assess. The hyperphagia scale was investigated in the Phase 2 study and is also investigated in Phase 3. The success or failure of the current study depends on whether or not it would show a measurable Improvement in hyperphagia symptoms compared to placebo. We need study participants to have enough of the severity of hyperphagia symptoms when entering the study, in order to be able to accurately detect whether or not the study medication is having an affect on that. So it's very important for this treatment for the study to be successful and hopefully results in the treatment becoming widely available to the PWS community. It's important for caregivers to be able to give accurate and honest answers about symptom severity during the screening and throughout participation. Q. How will I know if my child has enough hyperphagia to be eligible for the study? A. This study will enroll participants who have PWS nutritional phase 3. This means, in general, that they have a fairly significant degree of hyperphagia, an unrelenting sense of hunger, that in general they rarely feel full, and likely have significant difficulty being redirected away from seeking food or asking about food and food related topics. Iif you think that this might describe your child are reasonably well, even if you have some uncertainty or if you're unsure about whether or not they might or might not be eligible, then please do contact one of our study sites to discuss screening and they can ask you about these symptoms in a detailed way and make their determination about the study eligibility. Q. When will my trial site open? How will I know when my site is available? A. The most immediate information should be available through our website. I think especially if you go to the clinicaltrials.gov link on the levotx.com website, it should always be kept updated as each site becomes active and able to enroll patients. That’s probably the most immediate way to get updated information about what sites are currently enrolling. I would like to thank the team from Levo Therapeutics for joining us today and answering questions from our community members. If you are interested in learning more about this clinical trial, or others, you will find a directory of clinical trials at fpwr.org which includes contact information for each trial site. You can reach out to the trial site nearest you to enroll, or to ask any further questions you may have regarding participation. Clinical trial information can also be found at clincialtrials.gov. 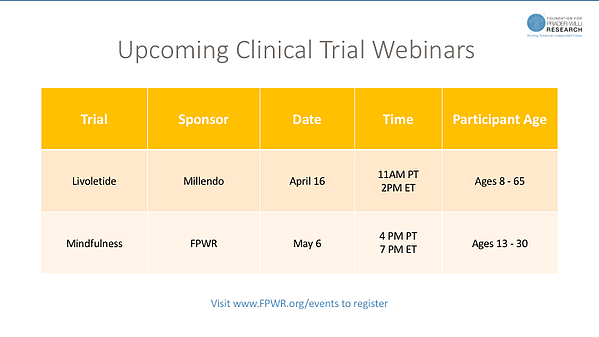 We invite you to join us for future clinical trial webinars. Millendo’s Livoletide clinical trial is expected to open soon and we will share information about that study on a webinar on April 16th. We also invite you to learn more about the Mindfulness intervention study which is aiming to improve temper outbursts using Mindfulness techniques. You can learn more about this study on our May 6th webinar. Thank you again for joining us today! Please continue to spread the word about these trial opportunities so we can enroll them as quickly as possible!